Action for Children 'The Giant Wiggle 2019' class. I will donate £1 to Action for Children for every ticket sold. Valid on any date when purchasing a full price child’s drop in ticket. Little Learners Northumberland are excited to announce another Saturday Messy Play & Mark Making Term. Come and spend some time with your little ones on the following Saturday’s at Beaconhill Community Centre 10-11am. 27th April: Does your little one LOVE to paint? We will have paper on the walls and floors for children to practise their Marks and express themselves in anyway they like! Wether they use brushes, rollers, sponges, hands, feet or scrapers it’s up to them! Discover their inner Michelangelo, Da Vinci, or Van Gogh! 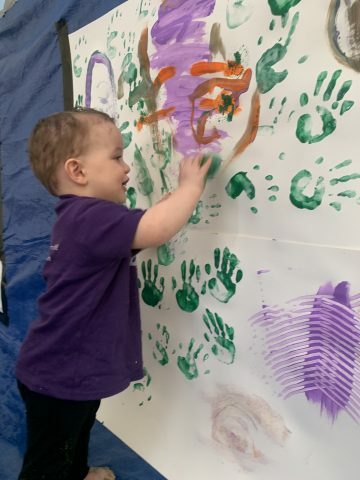 11th May: I’ve signed up to Action for children’s ‘The Giant Wiggle 2019’ which is a fundraising event to get kids active and learn about healthy eating. 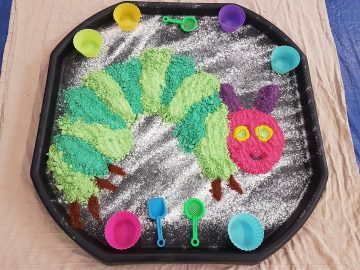 We’ll be linking this to our Marks by dancing them with our bodies as well as our usual ribbons and there will be healthy eating and ‘The Very Hungry Caterpillar‘ themed trays and activities. I’ll be donating £1 from every ticket sale to Action for children & would encourage you to try and fund raise before event with a prize to whoever can raise the most money! To find out what Action for Children will use the money towards click this link- Action for children. There’ll be a variety of wet & dry trays at every event as well as crafts and keepsakes to take home. And our usual fine motor stations too. Little Learners is aimed for children aged 5 months- 5 years but at our weekend family sessions older siblings are invited along too.